I love salads all year round. In fact, the majority of the meals I eat are salads. I know, boring right? In the winter months, I just try to create heartier versions. This meal was inspired by my Wheat Berry Salad with Cranberries. I wanted to create a gluten free version of that. So here you go. This is a meal that will keep you full for quite some time. It also makes about 4-5 servings. I love the earthy and nutty flavor of black rice. You can also use wild or brown rice. Place it onto a greased baking sheet with a little salt. Once the rice and squash are cooked and cooled, add them to a bowl with the remaining ingredients. This makes about 4-5 servings and should last in the fridge for at least a week. Enjoy! This colors are so vibrant! 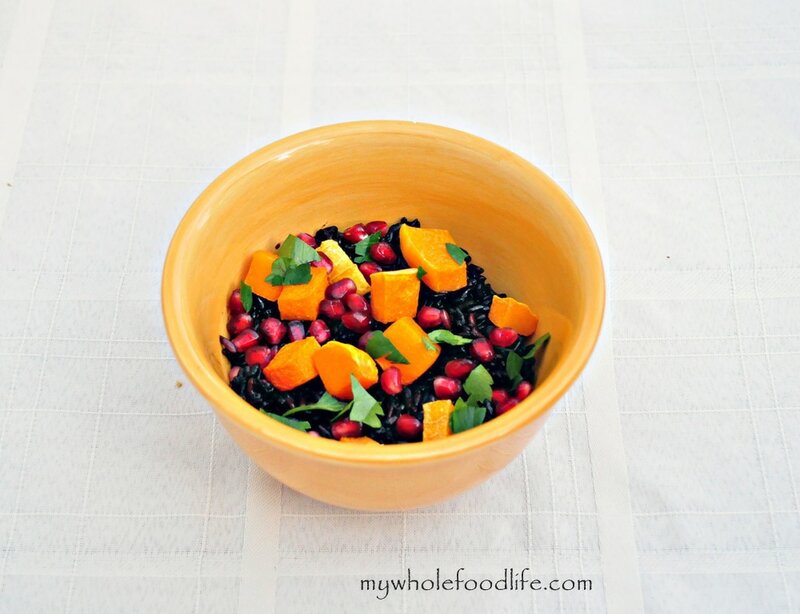 I will have to try this since I love black rice, squash, and pomegranates, just never thought to combine them!